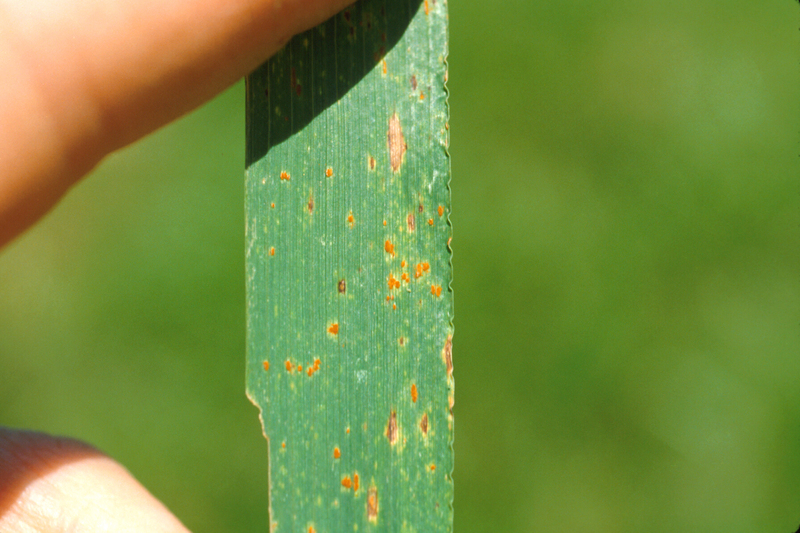 Leaf rust is brewing in some fields planted to rust-susceptible varieties in spite of the recent dry weather. I get the sense that disease severity may increase sharply in fields that have not been treated with a fungicide, and that experience at least one significant rain event over the next 30 days. Fusarium head blight risk has been uniformly low across the state this spring because of the abnormally dry weather. As a result, many fields that may have otherwise been treated with a fungicide, were not. Our Extension grains crop specialist, Jim Herbek, thinks most fields will be harvested about a week to 10 days earlier than normal this spring. If the 7-10 day-period before harvest is a time when the crop dries to harvest moisture, and with it now being only April 30, that means many fields will still have green tissue for at least another 30 days. That is plenty of time for leaf rust to do considerable damage to vulnerable fields of wheat. Modern fungicides are all extremely effective against leaf rust. Some, like tebuconazole (e.g., Folicur® and generics), are very cheap and can be applied up to 30 days to harvest. My main purpose in writing this article is to prompt you to look at wheat fields planted to leaf rust-susceptible varieties that have not been sprayed with a fungicide this spring, and evaluate the rust risk; if necessary, act while you still have time. Stripe rust is also visible in some fields, but at generally low levels. Hot and dry weather is very unfavorable for stripe rust, and we have had plenty of both during the last month. In addition, some fields are showing late infections of barley yellow dwarf which may result in a shorter grain fill period and limit the leaf rust risk. The main goal when it comes to leaf rust is to keep the flag leaf as clean as possible. Infections in the lower canopy infections have little impact in terms of reducing yield. Bleached head from freezing temperatures. The freeze damage on wheat became more apparent this week. The damage is spotty and tends to be more severe in the low areas of fields. Much of the wheat appears to have survived, but scouting to assess damage within fields is difficult. In order to understand the extent of damage within fields, almost the entire field needs to be walked. At the very least, the highest and lowest elevations need to be examined. Bleached heads are a clear indication of freeze damage to heads. Girdling around the stem would be another indication of freeze. Heads that appear bent over may be a sign of damage to the stem directly beneath the head. As more days pass, symptoms will become more visible (if damaged occurred). For more on wheat freeze damage, visit the Wheat Science Newsletter. In central Kentucky, we are seeing a lot of Barley Yellow Dwarf Virus (BYDV) on wheat. In some cases, fields were sprayed with an insecticide. In at least one case, the field was sprayed twice. In other cases, people scouted fields, followed aphid thresholds and elected not to spray. In all cases, the warm winter most likely elevated aphid levels and climate and biology overwhelmed chemistry. Armyworm larvae have been reported feeding in corn. Although armyworm can damage wheat, that very rarely occurs and when it does is usually much later in the season. Certainly this entire season is much earlier than normal because of the warm January – March temperatures. Nonetheless, the general sequence of events is likely to remain the same. 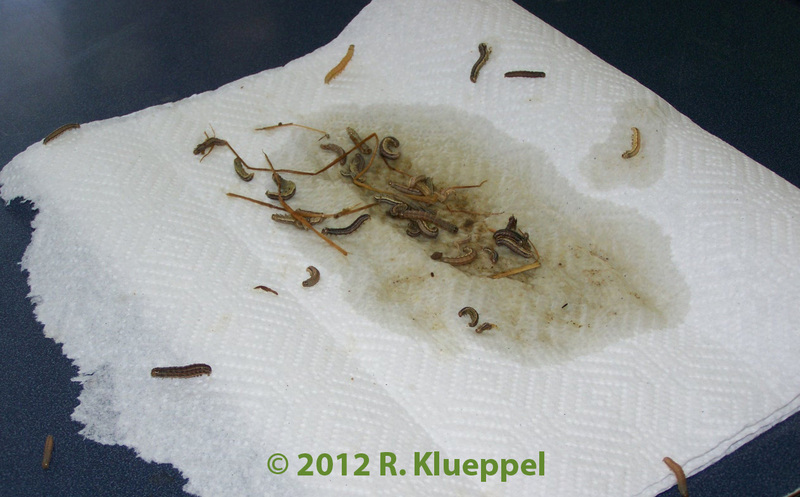 Captures of armyworm moths in the UK-IPM pheromone baited traps have not been very large. Captures did begin very early this year and the first several weeks appeared to be greater than the rolling 5-year average. However, recent counts have dropped below the 5-year average. At this point I don’t expect an unusually large population for 2012. That means that one should probably concentrate their scouting efforts on those situations that are at greatest risk. Watch for Cereal Leaf Beetle in Wheat. There have been reports of cereal leaf beetle (CLB) larvae actively feeding in wheat. This is not unexpected for this time of year. Generally this pest is not of great importance, but can always be problematic and should be monitored. This pest’s unpredictability is usually what gets producers in trouble. Often the first indication of the pest’s presence is “white” flag leaves waving in the air. This is NOT a good scouting procedure as one cannot put the leaf material back on the flag leaf! Cereal leaf beetle can be active anytime from April to maturity. This year populations are likely to be out early, though not necessarily in larger numbers. The reports that I have received are all larval feeding, indicating that the emerging overwintering adults have already been out for some time. Weather in some parts of Kentucky dipped below 30 degrees Fahrenheit last night (April 10 into this morning April 11). These temperatures are low enough to damage wheat that is heading. About 10 days of good growing conditions are needed to assess damage to the wheat crop. Some of the wheat is flowering and farmers need to make decisions now on spraying the wheat with a fungicide. Should they spray these fields? The following is a synopsis of a conversation with Don Hershman, extension plant pathologist. Recent weather forecasts include the potential for temperatures to dip into the low 30's or upper 20's (Fahrenheit) for the next couple of days. Much of the wheat around Kentucky is somewhere between the boot stage and heading, which means temperatures around 28 to 30 degrees could cause damage. Wheat sensitivity to cold temperatures depends on the growth stage (Table 1). If a freeze event occurs, the wheat will need about a week to ten days of good growing conditions before we can assess damage. At that point, we will need to examine the developing heads for noticeable signs of damage or death, the stem for signs of girdling (which could lead to lodging) and the tillers which could produce viable heads. normally are for this time of year. The FHB risk is very low except for a very small pocket of moderate risk in extreme southwest KY. Generally we have been warm and dry, but there have been some isolated showers in some areas in recent days. The potential for rain to occur in the form of pop-up thunderstorms is fairly high for today (Wed, April 4) and tomorrow (Thursday, April 5). Then we should have mostly clear weather beginning Friday though most of next week when many fields will be flowering. This bodes well for low FHB risk, but this could change rapidly if conditions decline. Generally, the hot, dry weather has greatly limited foliar disease development in most fields up to this point.